Set at 1893 meter high, the Alpage de Pré Rosset welcomes you in a old farm build in 1853 and entirely ……….. Without neighbours, the terrasse will set you either in front of the Mont-Blanc or by the desert of the Very hills. There, far from the rest of the world, we will suggest you, on one of our terrasse or by the fire feating some of our sleepers (that you can borrow any time), to enjoy traditional or original dishes improving local products. 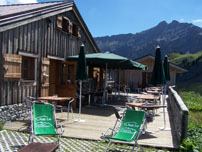 The restaurant is open everyday for lunch during summer and winter season and also for dinner afrer reservation. If you wish to stop for a night on top of our montains we will invite you to stay in our little refuge by the restaurant. Dans tous les cas, si vous cherchez votre chemin nous serons ravis de vous renseigner alors n’oubliez pas d’enregistrer notre numéro de téléphone : 04 50 93 58 84. N’hésitez pas non plus à nous contacter pour l’organisation de vos séminaires, rencontres ou tout autres évènements.